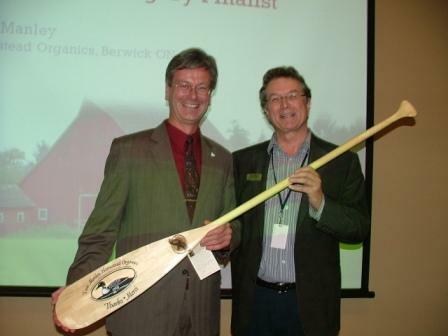 AgriNews Interactive, http://www.agrinewsinteractive.com, Copyright 1998 - 2003 Etcetera Publications (Chesterville) Inc.
At left, Tom Manley, co-owner of Homestead Organics in Berwick received a marked paddle from Charles Billington, with the Rideau Valley Conservation Authority at the inaugural Tri-Valley Conservation Awards Gala in Manotick on Oct. 22, 2008. Over 100 people from the Mississippi, Rideau and South Nation watersheds were on hand to hear and see the work of the groups and to congratulate them on their environmental achievements. One of 13 awards, the Agriculture Conservation Award was presented to a person who contributes to conservation and environmental stewardship in the area of the watersheds. Manley does this through his business initiative, Homestead Organics, an organic grain elevator, feed mill and farm service business and through his volunteer activities in promoting organic agriculture. These include years of chairing Eco-Farm Day, an information day for organic producers and years of serving as chapter chair of the Canadian Organic Growers Association. ​Photo courtesy of Ottawa Region Media Group.